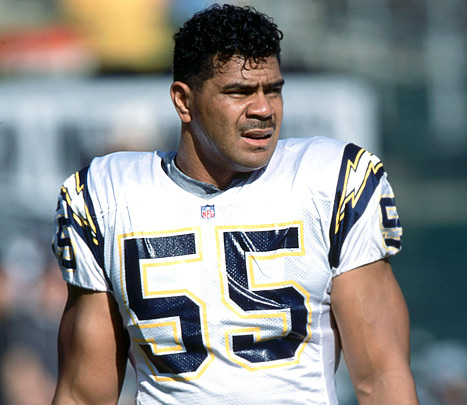 By now, everyone who follows the sports world has heard the NFL Hall of Fame Committee is holding firm in not allowing Sydney Seau to give a speech on her father, the late Junior Seau, at this year’s induction ceremony. A five minute video tribute will be shown before Sydney reveal’s her father’s bust for all to see. The Hall of Fame Committee ruled that starting in 2010, only a five minute video presentation would be shown for individuals inducted posthumously. This rule came a year after Bob “Bullet” Hayes and Derrick Thomas were inducted posthumously by Roger Staubach and Carl Peterson, respectively. Staubach and Peterson were told they had five minutes each to speak. Being the Navy grad that he is, Staubach ended his speech right at five minutes. However, Carl Peterson went on to speak about Carl Peterson for 26 minutes. This left Staubach angry as he confronted Master of Ceremony, Rich Eisen, who had gone backstage to ask what to do as Peterson had gone close to twenty minutes into his speech. Staubach had a reason to be angry because he now looked like a fool speaking only five minutes when he could have spoken for hours about his former receiver. In 2011, Les Richter was inducted posthumously into the NFL Hall of Fame and a five-minute video tribute was played. At the conclusion of the video, Richter’s son revealed his father’s bust before waving to the crowd and sitting down. The next player introduction began without a blink of an eye. This year marks only the second time a player will be inducted posthumously since Richter. No disrespect to Richter, but he played from 1952-1961 when the game was much different than it is today. The video tribute showed he was a hell of a player and worthy of the NFL Hall of Fame. However, it was hard for today’s generation to really appreciate Richter’s body of work as a player. Junior Seau is a different story. After entering the NFL in 1990 out of USC, he played close to twenty seasons before retiring in January 2010. Seau made the Pro Bowl twelve times and was named All-Pro ten times. He earned the 1992 NFL Defensive Player of the Year and was named to the 1990’s All-Decade team. Watching Seau play middle linebacker made you want to get out on the field and hit somebody. He was a physical and emotional player on the field, but one of the nicest players when not on the field. The fact that Seau committed suicide in 2012 and was later found to have CTE makes his induction interesting to many people. I look forward to the NFL Hall of Fame induction every year. The stories of each player are amazing and most bring me to tears. You aren’t human if you weren’t brought to tears by Michael Irvin’s emotional speech or Jim Kelly calling his son, Hunter, his hero as he suffered from Krabbe Disease which eventually took his life. So why did the NFL Hall of Fame Committee find it necessary to only provide a five minute video tribute for individuals being inducted posthumously? Time is a huge issue. I understand that speeches are constantly getting longer each year and people are sitting outside in the scorching sun for hours. But, is it fair to shortchange the families of deceased individuals being inducted? Why do they only get a five minute video tribute, albeit two minutes longer than living inductees? Talking in the video and unveiling their family member’s bust before sitting down feels like a raw deal to me. People want to hear heartfelt stories of these players that cannot be revealed in a five minute video. The NFL Hall of Fame Committee needs to revamp their Hall of Fame ceremony. The video presentation is a nice touch and saves time from presenters who used to talk just as much, if not more, than some of the inductees. However, living inductees should get twenty minutes to speak and presenters of deceased inductees should be given fifteen minutes. The committee must talk with each inductee or their family and be adamant that speeches must be reviewed ahead of time and stay within the designated time limits. If that means a timer is placed at the podium, then so be it. What cannot continue is favoring the living over the dead and not giving family members a chance to share stories that will move the crowd. Being inducted into the Pro Football Hall of Fame induction happens once in a lifetime for those that are fortunate enough to be selected. Why cut corners to save a little time?